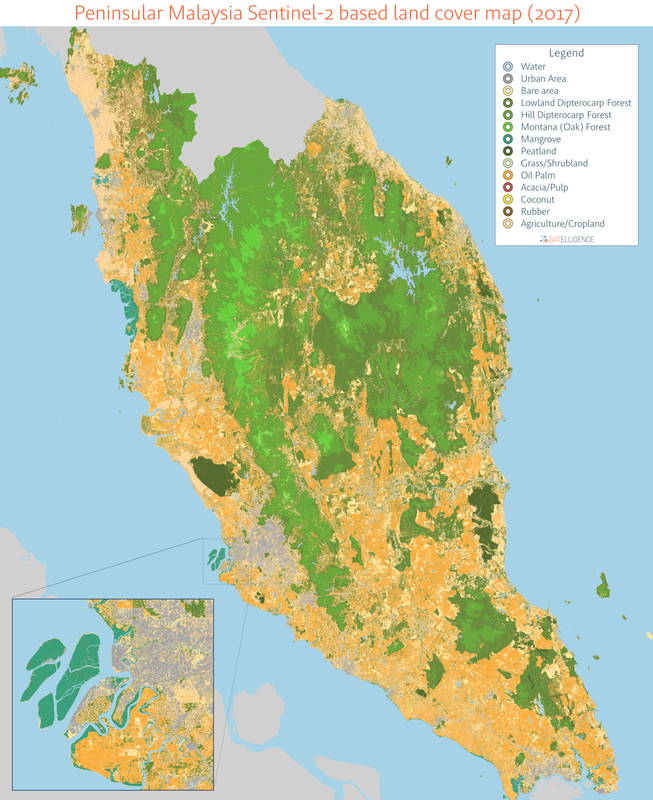 We recently worked with WWF-Malaysia's Sustainable Markets Programme to map land cover for entire Peninsular Malaysia at high detail, covering approximately 130,500 square kilometers (about 3x the size of the Netherlands). Leveraging the power of cloud computing we generated atmospherically corrected cloud free input data using all Sentinel-2 images from January 1st 2017 until December 31st 2017. Thanks to reference data kindly made available through WWF Malaysia and Sime Darby, we created around 1200 unique land cover reference areas to train our classification model pixel by pixel using fully automated advanced machine learning techniques. The resulting seamless map shows the extent of forests and other natural vegetation (grassland, shrubland), different types of tree plantations (oil palm, rubber, acacia/pulp), cropland, inland water bodies and urban surfaces at 10m resolution. Together with stakeholders, we will work on improving and verifying the land cover map so that it can serve as a baseline to monitor deforestation, forest and plantation cover in Malaysia. Sign up to receive e-mail updates from Satelligence. © SATELLIGENCE 2018. All Rights Reserved. Netherlands Chamber of Commerce number: 65413105. VAT number: NL856102052B01.